20-letni Hiszpan był do tej pory kojarzony wyłącznie z poziomem ITF. Ma na koncie aż 18 finałów futuresów i 7 końcowych triumfów. Zaskoczył niespodziewanie tydzień temu, gdzie zrobił swój pierwszy półfinał turnieju ATP. W Casablance pokonał m.in. Joao Sousę, a przegrał po 3-setowej walce z późniejszym mistrzem turnieju - Guillermo Garcią-Lopezem. In an all-Spanish final, Granollers will face eighth seed Guillermo Garcia-Lopez, who ended the run of newcomer Roberto Carballes Baena with a 6-2, 6-7(6), 6-4 victory. Carballes Baena was contesting his first ATP World Tour semi-final after qualifying into the main draw. The 21 year old had never won a tour-level match prior to this week. CH Kenitra: Carballes-Baena z tytułem. Morocco Tennis Tour – Kenitra (Kenitra, Morocco): Fourth seed Roberto Carballes Baena became the second Spaniard to win in Morocco in as many weeks, claiming his maiden ATP Challenger Tour title on Saturday. One week after falling to Daniel Munoz-de la Nava in the Meknes final, Carballes Baena moved to 28-19 on the circuit this year in downing countryman Oriol Roca Batalla in exactly one hour. Roca Batalla retired trailing 6-1, 5-1 with an adductor injury. Meanwhile, Munoz-de la Nava became the first player to attain 40 match wins this year in reaching the quarter-finals. CH: Carballes-Baena lepszy od Majchrzaka w Mohammedii. 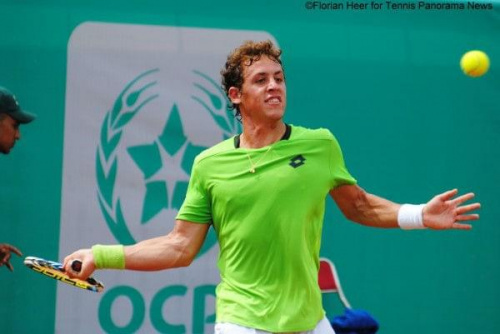 Morocco Tennis Tour – Mohammedia (Mohammedia, Morocco): Seventh seed Roberto Carballes Baena ended the Cinderella run of 19-year-old qualifier Kamil Majchrzak, prevailing 7-6(4), 6-2 on Sunday in Mohammedia. The final was postponed from Saturday due to rain and the Spaniard would claim his second ATP Challenger Tour title in one hour and 36 minutes. All three finals reached by Carballes Baena this year have come on Moroccan soil, having also finished runner-up in Meknes and the winner in Kenitra. Poland’s Majchrzak was the 10th different teen to advance to a final on the circuit this year. He dropped a combined 12 games in routing top seed Pablo Carreno Busta in the semi-finals, fourth seed Marco Cecchinato in the quarter-finals and fifth seed Inigo Cervantes in the second round.